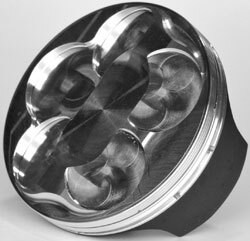 YFZ450R CP Pistons, for those that demand the ultimate in engine performance! High performance and racing Yamaha forged piston kits are available from CP Pistons for all model years of the YFZ450R racing ATV's. Standard bore size and big bore kits are available here. These forged pistons will work with oversize valves as well as high lift camshafts as they include oversize valve reliefs. They use a superior style forging for greater strength, durability and reduced weight. Along with the full radius dome designs, high performance piston rings and extremely strong wrist pins, these pistons offer the highest quality and are engineered for maximum power output. Get Holeshot Winning Power with CP YFZ 450R Pistons! CP Full Race YFZ 450R piston kits are custom pistons with shelf stocking part availability. These single ring, high compression, lightweight pistons feature a highly efficient dome design that maximizes squish without compromising performance. Lateral gas ports are added to maximize ring seal while skirt coating provides additional lubrication, minimizing friction in extreme conditions. Project X Platinum Kits feature the same top of the line products that top professionals rely on. The redesigned piston and rod combo gives your engine a lightweight assembly that is engineered to give you more power and durability. Revolutionary to the industry, these types of assemblies were once only available as custom pieces at custom prices. Now, off the shelf and available, these kits are just the thing you need to transform your bike into a racing machine without breaking the bank. Premium Carrillo YFZ 450R connecting rod provides superior strength for stock, high performance and racing engines. Designed with legendary Carrillo quality to give you an extremely strong and dependable replacement connecting rod at a reasonable price. Can be used as a stock replacement connecting rod as well as for high performance and racing engine use. The connecting rod listed in this row is for use ONLY with the matching CP Platinum series piston. This rod is 3.5mm longer than the stock rod and uses a 1mm smaller diameter wrist pin which is why it must be used with the matching Platinum series CP Piston.